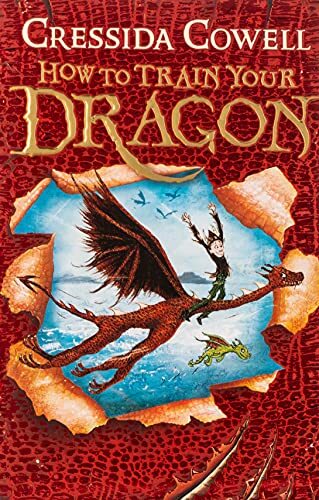 Read the HILARIOUS books that inspired the HOW TO TRAIN YOUR DRAGON films! Hiccup Horrendous Haddock the Third is a smallish Viking with a longish name. Hiccup's father is chief of the Hairy Hooligan tribe which means Hiccup is the Hope and the Heir to the Hairy Hooligan throne - but most of the time Hiccup feels like a very ordinary boy, finding it hard to be a Hero. In the first How to Train Your Dragon book Hiccup must lead ten novices in their initiation into the Hairy Hooligan Tribe. They have to train their dragons or be BANISHED from the tribe FOR EVER! But what if Hiccup's dragon resembles an ickle brown bunny with wings? And has NO TEETH? The Seadragonus Giganticus Maximus is stirring and wants to devour every Viking on the Isle of Berk . . . Can Hiccup save the tribe - and become a Hero? READ ALL 12 BOOKS IN THE SERIES! You don't have to read the books in order, but if you want to, this is the right order: 1. How to Train Your Dragon 2. How to Be a Pirate 3. How to Speak Dragonese 4. How to Cheat a Dragon's Curse 5. How to Twist a Dragon's Tale 6. A Hero's Guide to Deadly Dragons 7. How to Ride a Dragon's Storm 8. How to Break a Dragon's Heart 9. How to Steal a Dragon's Sword 10. How to Seize a Dragon's Jewel 11. How to Betray a Dragon's Hero 12. How to Fight a Dragon's Fury How to Train Your Dragon is now a major DreamWorks franchise starring Gerard Butler, Cate Blanchett and Jonah Hill and the TV series, Riders of Berk, can be seen on CBeebies and Cartoon Network.